Shnipp the dog loves to play fetch with Julie and Lara in the park, but she doesn't love their annoying laughs. So one day she decides to run off. It's not long before Shnipp finds a new life with Bessie the Bagel Lady, eating delicious bagels every day. Fotz is the character that I like. It was a really good book because there was lots of bagels. It was an adventure book and it was funny. Schnipp the dog got lost and had to try and get home. Good because he ran away and got lost but.....but she found her home again! 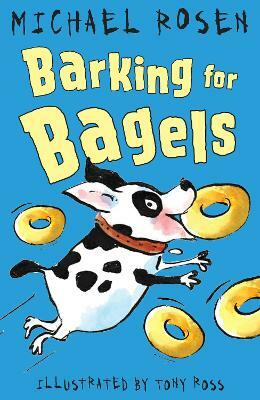 This was a funny book about a dog called Schnipp who loves bagels! Good because Shrimp Finlay gets back home. I loved this book due to how Michael Rosen interacts with the reader. I liked the book but it could have been a lot more interesting and exciting than it was. This is a great book that has suspense at the start. It's also very eye catching. Because it was very fun and interesting. It is a hilarious read that will make you laugh and enjoy your self. I love the name of the dog which is shnipp. enjoyed this book, thought Shnipp was funny and greedy. Shnipp the dog runs away one day when he goes for a walk and meets Bessie the Bagel Lady. Shnipp thinks of her tummy and stays with Bessie because of all the bagels she gets to eat. One day Shnipp decides to go home to her family but find another dog has moved in! Short story. Easy to read. Very funny and not too long to read.